ДОМ "ТИХАЯ ЗАВОДЬ" is set in Maymery and offers ski-to-door access and a private beach area. Guests staying at this chalet have access to a fully equipped kitchen and a terrace. Apartment on Spasskaya 5 is situated in Uglich. Guests may enjoy free WiFi. 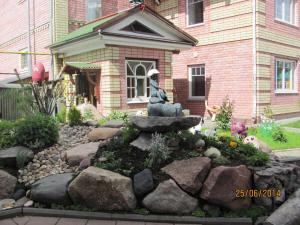 Situated in Uglich, Hostel v Ugliche offers a shared lounge. The accommodation offers a 24-hour front desk and free WiFi. Offering a barbecue and views of the river, Campsite Perepelinyi ostrov is set in Vasilëvo in the Tver Region Region, 18 km from Uglich. Campsite Perepelinyi ostrov also includes a sauna and offers massage treatments.